There is no more illustrious warship name in British naval history than HMS Victory, which is inextricably linked with Admiral Lord Nelson and the Battle of Trafalgar. In 1805 the most famous Victory was the scene of Nelson's greatest triumph and also his death. She is today preserved at Portsmouth as the oldest commissioned warship in the world. Less well known is that six previous warships also carried the name. The first Victory was Sir John Hawkins' flagship during the Battle of the Armada in 1588 while the loss of the sixth in 1744 was considered a national tragedy. All manner of maritime life is included in this book, from piracy in the Azores to gentlemanly encounters between fleets and the battle of annihilation that was Trafalgar. The full horror, majesty and thunder of naval strategy and warfare in the age of fighting sail are all revealed via first-hand accounts of the action and key events. The post-Trafalgar career of Victory is also studied, including her part in destroying Napoleon's hopes of conquering Russia. We also learn how HMS Victory was saved for the British nation and the world. 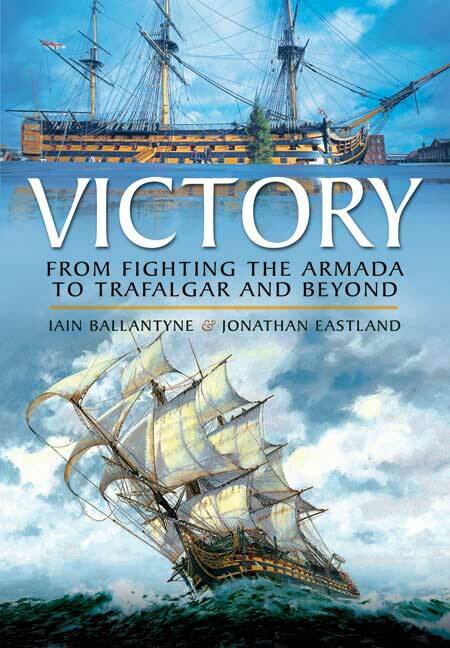 Researched and written by leading maritime experts Iain Ballantyne and Jonathan Eastland, 'Victory' will be enjoyed by all those interested in naval heritage and the proud fighting record of the Royal Navy. A curious and interesting book for lovers of naval history of all time and those who like stories based on real events. I did read it cover to cover and found some interesting snippets. It is well illustrated and easy reading; entertaining for the generalist reader. This book places the story of HMS Victory, in all her seven incarnations, within the wider historical context and is more than just a mere service history and for that the authors are to be commended. If you are interested in this iconic ship you will certainly find much of interest. An admirable volume on a great ship and symbol of naval prowess. In addition to utilizing rarely quoted primary sources and providing a comprehensive summary of Victory's service, they set the stage with narratives covering the history of the vessel's early namesakes that extends to 1560 and service that included the defeat of the Spanish Armada. Victory is a very readable and interesting introduction to the navy’s evolution, those who served aboard the various vessels, and the immortal ship that is now the Flagship of the Royal Navy’s First Sea Lord. One element that makes this book stand out is that the authors don't just relate stories about the commanders who served aboard the seven warships; also told are tales from those who served under the officers. Rather than rehash than material that has appeared in print before, Ballantyne and Eastland culled the archives to incorporate new or forgotten gems. Victory is a very readable and interesting introduction to the navy's evolution, those who served aboard the various vessels, and the immortal ship that is now the Flagship of the Navy's First Sea Lord. HMS Victory is the oldest commissioned warship, now displayed in drydock at Portsmouth. Since she was placed on display, millions of people of all ages from around the world have come to see her. That a brilliant young fleet commander died in his moment of victory, on a ship named Victory, is an enduring legend. There is unlikely to be another Victory in Royal Navy service because Nelson’s Victory will be lovingly maintained and the Royal Navy is most unlikely to decommission her, denying the name to future British warships. So strong and international is the iconic HMS Victory as Nelson’s Flagship at Trafalgar, little thought is given to those earlier British warships that carried the name Victory. In this carefully researched book, the authors have redressed the situation. They have provided a great deal of information and a good glossary, covering the vessels between Hawkin’s Victory and Nelson’s Victory. Naturally the Trafalgar Victory has been covered in its fighting days and in its later service as a key piece of British naval heritage. There is genuinely new information and balanced coverage from first to last Victory. The standard of illustration is very good and adds greatly to the work. This is one of those essential books that no one following naval history can afford to be without. Eloquently written. Handsomely presented. The characters remain in the mind. Devoted to a superbly illustrated tour of the vessel as she is today.